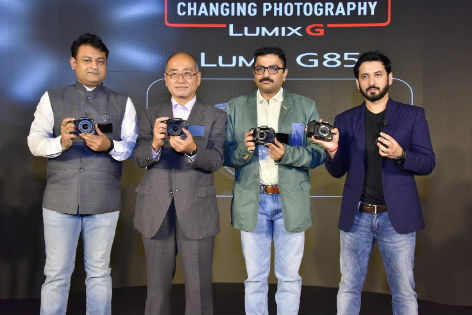 New Delhi: Paving a new path towards 4K revolution, Panasonic India today launched the new Lumix G7 and G85 in the Digital Single Lens Mirrorless (DSLM) category. They have been designed to address the need for quality videos for filming, YouTube and still photography. These lightweight cameras come equipped with 4K video recording & editing capabilities. The camera models will be available at all Panasonic stores across the country. The Lumix G85 will be available at a price of INR 72,990 and the Lumix G7 will be available at INR 53,990. The Lumix G7 also, comes with dual kit option of 1442 mm + 45150 mm at INR 58,990. The 16.0-megapixel Digital Live MOS Sensor without Low Pass filter and the new Venus Engine combine to achieve crisp, high resolution images in detail with high contrast, impressive color reproduction and max. ISO 25600 high sensitivity. The LUMIX G85 is capable to record smooth, high-resolution 4K video in 3840×2160 at 30p / 25p (50Hz Area) 30p (60Hz Area) or 24p in MP4. The LUMIX G85 is also capable of real-time image output to the external monitor/recorder via HDMI simultaneously while recording video. The LUMIX G85 incorporates the new 5-axis Dual I.S. (Image Stabilizer) 1* which has advanced to boast even more powerful and effective blurring suppression. A maximum of 150 frames in five seconds following a designated frame can be saved. In addition, the camera incorporates Light Composition function as a new option of 4K PHOTO mode besides synthesizing the images by choosing and saving brighter pixels. This makes it possible to produce more luxurious, dramatic images of situations such as fireworks or night scenes inside the camera with ease. The Lumix G7 is capable of recording smooth, high-resolution QFHD 4K video in 3840×2160 at 25p (50Hz) or 24p in MP4. Taking advantage of 4K video recording performance, users can capture the fleeting photo opportunities at 30 fps in 8-megapixel equivalent resolution. The DMC-G7 integrates a 16.00-megapixel Digital Live MOS Sensor that achieves both higher resolution and higher sensitivity image recording with minimum noise. The image processor Venus Engine with quad-core CPU that lets high speed signal processing resulting in 8 fps(AFS) / 6 fps(AFC) to capture fast moving subject just in-focus. Integrating superior noise reduction systems, DMC-G7 enables shooting at max.ISO25600. Adopting a static-type touch control system, the 3-inch free-angle rear monitor with 1040K-dot high resolution features approx.100% field of view. With these immense capabilities complimented by, the models Lumix G7 and Lumix G85 are exceptionally imperative tool for amateurs and professionals who demand 4k camera in affordable range.